The Tether Table Aero iMac provides photographers with a stable portable tethering platform, perfect for daily studio use and the ideal out-of-studio workspace. It attaches easily to virtually any tripod or light stand and is compatible with all standard mounting hardware. Aero Clip-on Hooks can attach to any flat edge of the Tether Table and are ideal for hanging lightweight items such as cables, cords, or other accessories. The Aero SecureStrap for the Tether Table Aero System is designed to fasten your laptop computer to your Tether Table, insuring it will stay firmly in place. 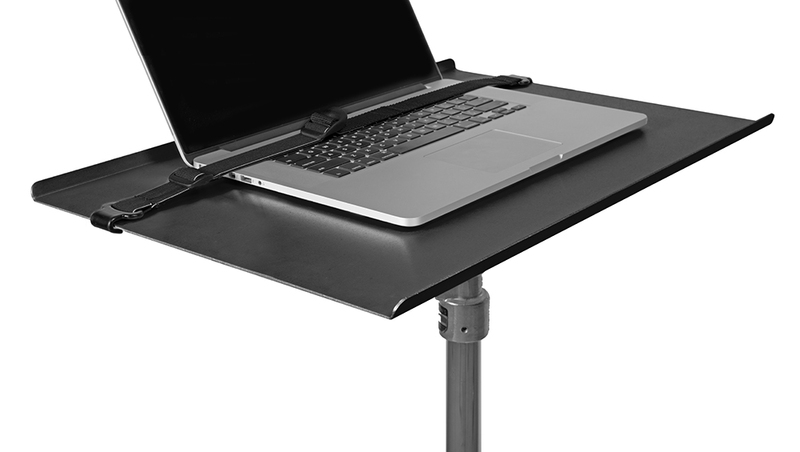 The universal adjustable strap fits all Tether Tables Aero's and all laptop sizes. The Tether Table Aero iMac allows photographers and videographers to easily incorporate an Apple iMac or Cinema Display into their studio or location shooting workflow. The Tether Table Aero System was conceived by professional photographers and designed by aerospace engineers to meet the needs of photographers seeking a portable tethering platform. Made completely of T6 aerospace aluminum, the non-reflective black platform is sleek in design and unsurpassed in stability & durability. The Aero for the iMac features a SecureGrip Stability Bar across the top of the platform. Simply slide the base of the iMac under the stability bar and tighten to ensure a secure set-up in any environment. Both the SecureGrip and the Aero platform are lined with high-grade, non-slip padding to firmly attach any iMac or Cinema Display, protecting the monitor from slipping and scratching. 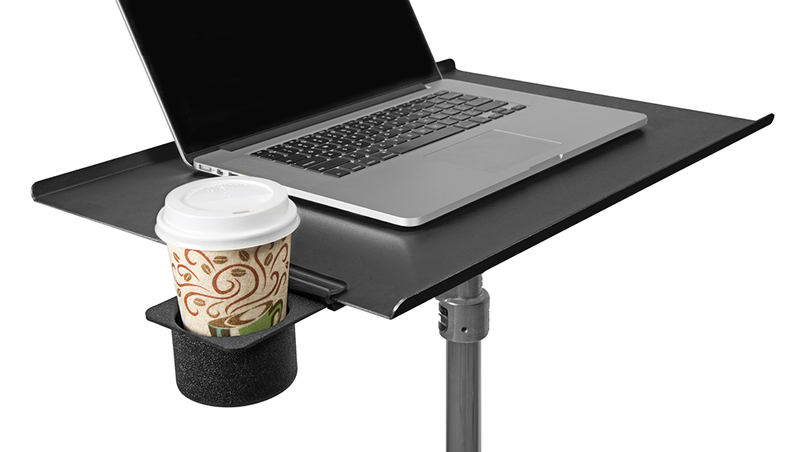 When not using an iMac, the SecureGrip Stability Bar is easily removed from the table to allow the platform to be used as a laptop computer stand or workstation for holding lenses, batteries, notes or any type of gear needed within arm’s reach. The Aero Series’ state-of-the-art design and functionality offers integrated mounting onto any 1/4″-20 tripod head, 3/8″ tripod mount, 5/8″ stud studio stand or Arca-style mounting attachment. The Tether Table Aero iMac mounts to any stand, tripod or arm in just a few seconds, no adapters needed using the LAJO-4 ProBracket. 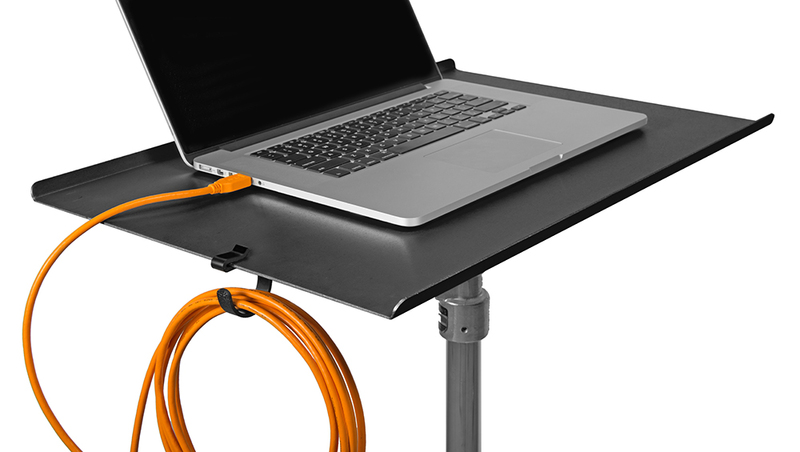 The Tether Table Aero was designed to meet the needs of not just photographers, but all creative individuals looking for a portable, secure iMac table to attach to a tripod or stand. It integrates with the complete line of Tether Table Accessories. *Please note the purchase of the Tether Table Aero does not include a stand or tripod. Please see our Tripods & Lightstands if a support is needed. Stands & tripods have different weight limits. Please consult the manufacturer’s guidelines prior to attaching your Tether Table. Additional accessories sold separately.